The first thing that came to my mind was a previous blogpost on tomato gels with the pectin that’s there. Pectin in tomatoes is highly methylated (HM), meaning that a lot of sugar would be required for it to gel and that gelling is not promoted by calcium. 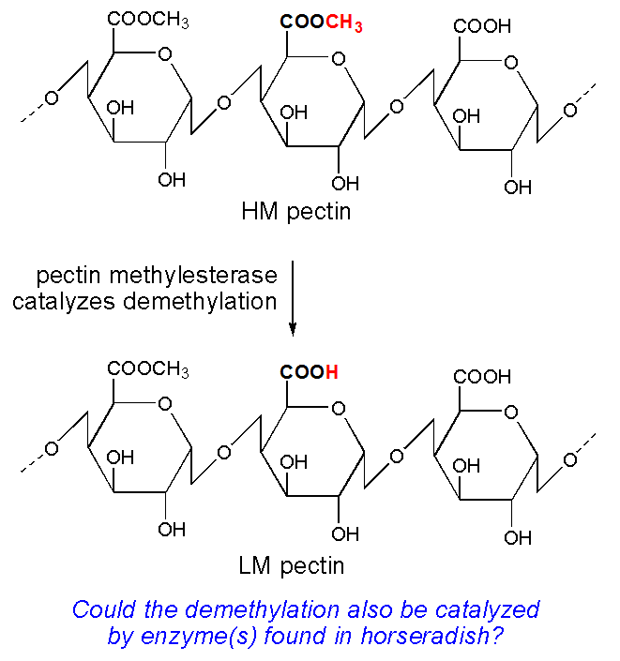 But if it is mixed with juice from carrots or oranges which contain the enzyme pectin methylesterase (PME), the methyl groups are cleaved off (as shown below) to yield a low methylated (LM) type of pectin which will gel more easily, especially in the presence of calcium ions. Could something similar be the case in the gelled seafood sauce? Once horseradish is cut, enzymes start to break down sinigrin to release allyl isothiocyanate (mustard oil) which is responsible for the pungent taste and the irritating effect on the eyes and sinuses. 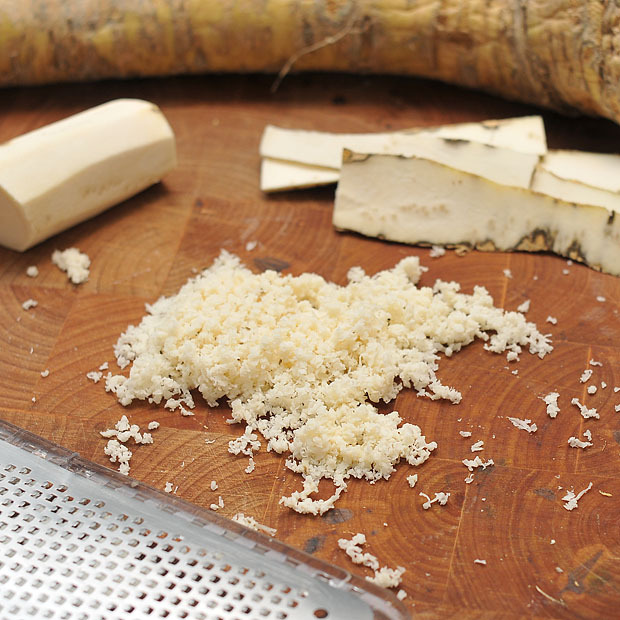 In biochemistry, horseradish is best known for an enzyme called horseradish peroxidase. I’m not sure if this is the enzyme that is responsible for the degradation of sinigrin, but adding together the bits and pieces my best guess is that some enzyme in horseradish does more or less the same thing as pectin methylesterase, cleaving of methyl groups to make the pectin more prone to gel. I haven’t been able to find any papers on this though, so if any readers know more about his – please feel free to fill me inn! And can you think of other foods where horseradish advantageously could be used for gelling? Before writing this blog post I wanted to test the gelling, so I took a pieces of horseradish, peeled it and grated it. The gratings were quite dry so I decided to mixed them with some water and then filter the mixture to obtain a horseradish extract. The Areopress coffee maker turned out to be perfect for this (as shown in the picture above). I then mixed the extract with approximately 6-8 times the amount of ketchup and left it in the fridge to gel. 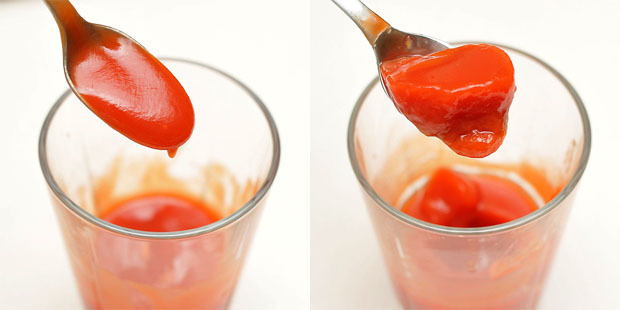 A before-and-after picture of the ketchup mixed with the horseradish extract is shown below. If I would make this again however, I’d probably not bother about filtration – instead I would use a food processor with knives to break up the cells in the horseradish as much as possible to maximize the release of the intracellular enzymes. 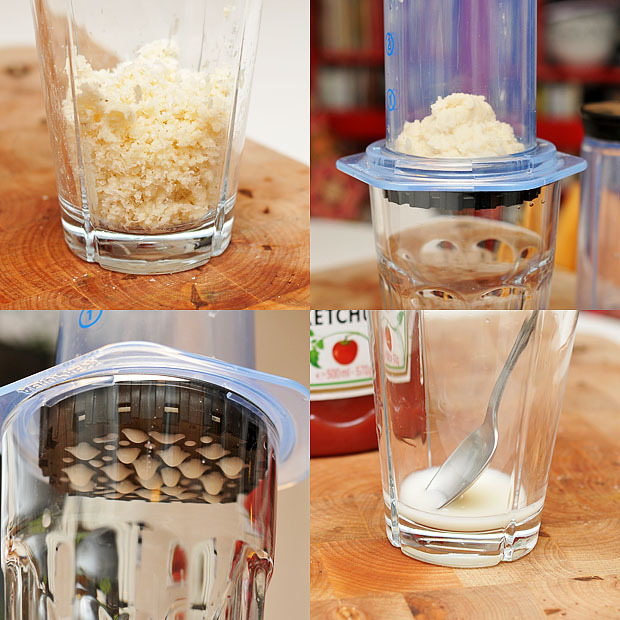 Grate/grind horseradish with a little water. Mix with ketchup. Adjust with lemonjuice (and possibly salt) to taste. Refridgerate. The gelling doesn’t happen until a day or so later. Tomatoes can make a pectin gel by themselves. Take a fresh tomato, put in in a blender, then let the preparation stay in the fridge for a couple of hours : you get a gel. It’s quite soft, but it’s a gel. Hervé This mentionned this fact on a French radio program about a year and half ago. He also mentioned that you can filter the blended tomato and you get a clear liquid (since lycopene dissolves badly in water, it tends to stay with the solid parts, IIRC, hence the absence of red color) which contains pectins, and this juice will gel by itself also (but this I didn’t try). He concluded by saying that if you heat the juice, you have to cook it for a long time (30 min?) before the pectins start gelling again. I don’t remember the reason why a bit of cooking prevents gelling (if he gave any reason at all during the show) and why longer cooking time allow gelling again. That may be right, but I used Heinz ketchup which contains tomatoes, vinegar, sugar, salt and spices. 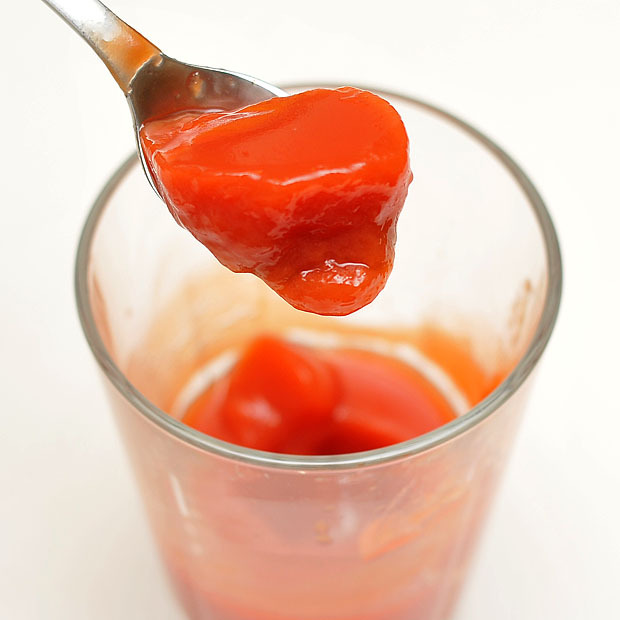 The gelling effect depends on the fact that tomatoes contain pectin – not the possible addition of other hydrocolloids. I’m interested in the use of the aeropress as an extractor. Did you use it for other extractions beside coffee and horseradish? It seems it could be a nice not-expensive tool for using in the kitchen (like the isi whipper for infusions). Yes – I’ve used it for other solid-liquid separations as well. Wherever you would normally use a coffee filter the Aeropress can speed up things a little. You might be interested to know that I recently made a mint and orange puree that formed a pretty solid gel after 2 days in the fridge. The only ingredients were fresh squeezed orange juice from navel oranges and fresh mint. Could this be related at all? Misha: Very interesting! Yes – citrus fruits are rich in pectins, so this could be related. Any special kind of mint you used for this?